While owning a home remains a dream for the majority of the people in India, the billionaires and the Bollywood celebs are buying homes worth millions or even billions. Here we go through some of the most expensive homes in India. Antilla of Mukesh Ambani tops the list among the most expensive homes in India. 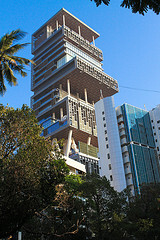 Without any doubt, Mukesh Ambani’s billion dollar home Antilla is the most expensive home. Though this is built in 27 stories, the height equals to forty stories. It is because some of the stories are built as double stories. This is located in the second most expensive location Altamount Road in Mumbai. The project has all world class amenities and facilities including health club, spa, terraced garden, temple, etc. The estimated cost of this project is Rs.4500 Cr. Interestingly a flat in the NCPA Apartments is counted among the most expensive homes in India. Though this flat was bought for a mere Rs.34 Cr, considering the then property prices and the sluggish real estate market, this apartment is considered as one of the most expensive apartments. The then cost of the property was thus Rs.97842 per sq. ft. This apartment is located at Nariman Point, one of the most posh areas in Mumbai. Shahrukh Khan owns a palatial home called Mannat. The estimated price of the home is Rs.70 Cr to Rs.100 Cr. While luxury features are in abundance, a good amount is spent for modifying the home with the paintings of MF Hussain and other arts and crafts works. 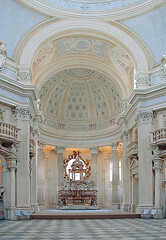 The interiors of these most expensive homes look really royal and palatial. Gautam Singhania’s JK house is another costliest home in India. The home of Raymond Group owner is built in 30 stories. The 145-metered mansion is located at Breach Candy in South Mumbai. Besides bringing all luxury facilities and amenities under one roof, this mansion provides a clear view of the sea to which it is facing. Kingfisher chief Vijay Mallya has recently built a palatial mansion at UB City in Bangalore. Mallya’s penthouse ‘White House in the Sky’ spreads over one acre of land and has all luxury features. A helipad also is built on the roof. Besides this, the Mallya’s mansion has all features life health-club, spa and many other facilities. Anil Ambani is constructing a new home at Pali Hill Area in Mumbai. The estimated cost of the project is Rs.5000 Cr. The awesome abode of Anil Ambani is to be built in a land area over 1537 sq. m. Once completed, this will surely be included among the most expensive homes, probably more expensive than Antilla. Tata Group Chairman Ratan Tata owns a graceful home at Colaba, Mumbai. The sea-facing 13,500 sq. ft. mansion is built in three stories, but divided into seven levels. Having all facilities which are peculiar to any mansion of a billionaire, this too finds a place among the most expensive homes in India. This entry was posted in Articles and tagged Anil Ambani, Antilla, Gautam Singhania, JK House, King Fisher, Mannat, most expensive homes, most expensive homes in India, NCPA Apartments, Ratan Tata, Raymond Group, Shahrukh Khan, Tata Group, Vijay Mallya, White House in the Sky by designer. Bookmark the permalink.